On Labor Day weekend, I mentioned some friends came over and helped us with a summer honey extraction. Ian, Kristina and Jenny are all absolute troopers, always willing to lend a helping hand when it comes to all things apiary (and beyond; these are, as it's said around these parts, "good people").What I didn't have in that post were photos of the extraction process itself, but now I do (courtesy of Ian himself)! To see many, many more images from that day, go here. We busted it out, while Hubs and our friends Jen, Jon and their lovely daughter Awynn played with Huxley and cooked up a scrumptious brunch. J & J were visiting from Atlanta, where they live and work as art instructors at two private schools. These are some of my most beloved, treasured, dear friends. They are all-around wonderful people who I keep trying to entice away from the hustle and flow of the ATL and onto the land beside us! It was amazing, humbling, captivating work. Every time I drizzle some of this precious nectar onto my morning yogurt, I look on in awe. Thank you so very much, bees, plants, humans and beyond, for this transformational experience! If you know me personally, then you know that I have a sweet tooth. It cannot be helped. It's genetic, you see, with my Pop always having something sweet after dinner, his mom (Gran) always maintaining a candy drawer for her multitudinous grandkids to draw upon, my mom typically stashing atomic fire balls in her purse, and her mother (Nanny) drinking her iced tea as sweet as sweet can be (I cannot begin to tell you how many times we're been out eating somewhere and she frustratedly states "this tea is not sweet enough"). While I try to temper my cravings and enjoy my sugar judiciously, I will openly admit to enjoying a little sweet sumpin' sumpin' with regularity. You need the sweet in life to help to overcome the sour, yes? Owing to that tendency, and coupling it with a profound and abiding fondness for baking and confectionery-making, I found myself looking several weeks ago for a go-to how-to book on creating candy at home. And that's when kismet struck. Beth Sweet (one can only imagine the sweet tooth possessed by someone with such a last name! ), editor at Lark Crafts (my publisher), knew nothing of my searching. And yet (AND YET!) she sent me an email wondering if I might be interested in reviewing and possibly giving away a copy of a new book she'd edited, Sweet Confections: Beautiful Candy to Make at Home by Nina Wanat. How terribly serendipitous! How immensely auspicious! Why, yes, indeed, Beth, I would be interested! Yes. Indeed. And so it was that this fine book on candy-making came into my world. With glorious styling and expert photography throughout (courtesy of White On Rice Couple Diane Cu and Todd Porter), Sweet Confections will make a home confectioner out of you in no time. The recipe titles alone are enough to make your teeth ache, your dentist grin, and your mouth water: Salted Chocolate Caramel Lollipops! Honeycomb Candy! Orange Walnut Chocolate Nougat! Vanilla Marshmallows! If you, like me, enjoy the sweeter side of life, then I invite you to leave a comment below, sharing with me your absolute favorite sweet. It's hard for me to choose favorites when it comes to this particular category, but, if backed into a corner, if forced on my life to pick just one, I'd probably say the salted caramels at the French Broad Chocolate Lounge. They are absolutely transcendent; like giggles from a baby, they'll soothe whatever ails you. I say this from a vantage point of much, much experience. The giveaway will run for one week, ending next Monday, October 3rd (is it really October already?!!) midnight EST. As with prior contests, it's open only to domestic small measure readers (sorry international buddies!). And do be sure to leave me some means of reaching you in your comment, either by leaving an email address or a link back to your blog or website. *As a sweet treat, Beth recently posted this Candied Apple recipe from Sweet Confections, perfect for autumn! **UPDATE: The winner of "Sweet Confections" is Booga J, lucky #18 according to the Random Widget! Thank you everyone that stopped by. Look for another fantastic giveaway soon (this one is personal-it's for a copy of my friend Jodi 's brand spanking new book, Cake Ladies!!!)! Alright, friends. It's time to chat chickens!!!! I'm prepping for the "Backyard Chickens" class I'll be teaching tomorrow evening at the local community college and that got me thinking that I need to post my next class chez English. So, let's engage in a bit of "fowl language," to borrow from the title of my very clever friend Kristina's column in Chickens magazine. This is a great time of year to start talking about chickens. If you've got them, we'll discuss things to survive the winter intact. If you're thinking of getting them, we'll discuss what's involved in sourcing chicks and caring for them. In short, we'll go from chick to layer-comb to toes, as it were. *The class will run from 11-2 p.m..
*Class cost is $40 per person. *Lunch will be provided, along with beverages, and is included in the cost, along with hand-outs. *Size is limited to 15 people. If you're interested in attending, let me know in your comment. Please be sure to leave a means of contacting you there, as well, or, if you'd prefer to keep your information private, just shoot me an email at: ashleyadamsenglish(at)gmail(dot)com. Also, if you have any dietary concerns (vegetarian, vegan, gluten-free, hate raw onions, etc. ), let me know in your comment please. What a time we had in St. Paul! Not only was the Creative Connection Event itself inspiring, invigorating, and infectious, Huxley was a total champ, Midwesterners offered up their customary kindness, and the food scene was totally off the hook. Since so much of my time was taken up with the conference itself, we tried to make our meals outside of the event truly memorable. Boy, were they ever. Next to the hotel itself was the stellar Senor Wong, an Asian/Latin-fusion joint. Hubs declared their sweet potato fries the best to have ever passed his lips, while I will never, ever forget their Yuzu curd with meringue (I die!). Friday morning found us at the iconic Mickey's Diner, where the pancakes were fluffy, the accompanying butter house-made, the coffee hot and served in those diner mugs possessed of such perfect heft, and the waitress both curt and kind all at once. We loved it. For lunch, we stopped at Heartland Market Cafe. While we'd love to have dined at the main restaurant (whose rotating menu is built around seasonal, local foods), attempting to do so with a wiggly, wily baby seemed like no one's idea of a good time. Instead, we enjoyed sandwiches filled with in-house cured meats and seasonal condiments, locally brewed sodas, perfect cappuccinos, an expert Russian tea cake (for me) and a spot-on berry-topped cheesecake (for Hubs). We rounded the corner in search of somewhere to eat after leaving the market only to run into Potter's Pasties & Pies. A food truck run by a married Brit and a Minnesotan (brand new parents as of the 15th!!! ), Potter's offers AMAZING meat and veggie hand pies. We sampled the following before collapsing into grunts and groans of gustatory delight: The Traditional-minced beef, carrots, potatoes, onions and gravy; The Pig-braised pulled pork, apples, onions and coriander (this one garnered the most amount of "oh my god!" exclamations-they have magical ways with pork, these Potter folk); and their Sausage Roll-sausage rolled up in pastry dough. If Asheville had such a food truck, I'd be tempted to work them into my daily routine. While our foray in St. Paul was brief, it was nonetheless bright and blissful. If you'd like to see more images from some of the places mentioned above (as well as Huxley looking incredibly happy at the incomparable Minnesota Children's Museum, where we went twice on Friday, so great was his love for the place), go here, here, here, and here. Almost a year ago, we threw our forthcoming wee one a shindig, and dubbed it a Nugget Warming (for those of you new to this blog, "Nugget" was Huxley's in utero nickname). We'd had two other baby showers thrown for us, but we wanted to put our personal spin on things, cook up a mess of seasonal, local food, and gather around the fire ring with a smattering of our nearest and dearest. You can read about the hijinks, shenanigans and general merriment that surrounded the event here. Our Nugget Warming was also captured for all to see and entombed in posterity in the brand new book Where Women Cook-Celebrate!. Some of you may recall that I write for Where Women Cook magazine (the fall issue, where I chat about all things apple, is available in stores now!). Where Women Cook-Celebrations is produced by Jo Packham, the force behind the magazine, as well as Where Women Create magazine (which is also available in book form). It showcases celebrations thrown by "28 bloggers, chefs, cookbook authors and kitchen creatives", ranging from Fourth of July bonanzas (Ree Drummond!) to finding seasonal joy in cooking up a big pot of risotto (Béa Peltre!). I am completely honored to be included in the company of such incredible women. While the book officially publishes October 4th, it will be offered up in advance at The Creative Connection Event. We 3 Englishes are headed that way tomorrow morning, returning home on Sunday (wish us luck-Huxley will be with Hubs for a good chunk of the event and he's used to having access to mama whenever he pleases!!!). I adore a good celebration. I'm in the midst of planning a very special one right now, to take place in late October, celebrating the first journey around the sun for the same Nugget celebrated one year ago!!! Pardon the radio silence, friends. I've been taking care of buzz-ness (just go with it), you see. Last weekend, with the help of several friends, I extracted honey from my two hives. A smattering of the honey gathered is pictured above. Three medium supers yielded 5 gallons before bottling and 12 quarts, 19 pints, and 4 1/2-pints once jarred. My little ladies were working some kind of hard all spring and summer-long. I considered extracting in spring, as well, but found myself just too overwhelmed with books and baby, and decided to wait until late summer instead. My book details the process of extraction, if you're a new-bee looking to extract. I'd highly suggest recruiting friends to aid in the endeavor, enticing them with a jar or two of the good stuff in exchange. Many hands make quick work of uncapping the wax from each frame, placing the frames in the centrifuge and then churning out the honey. Fortunately, my local bee club rents all of the items needed for extraction for a mere $20 to members. 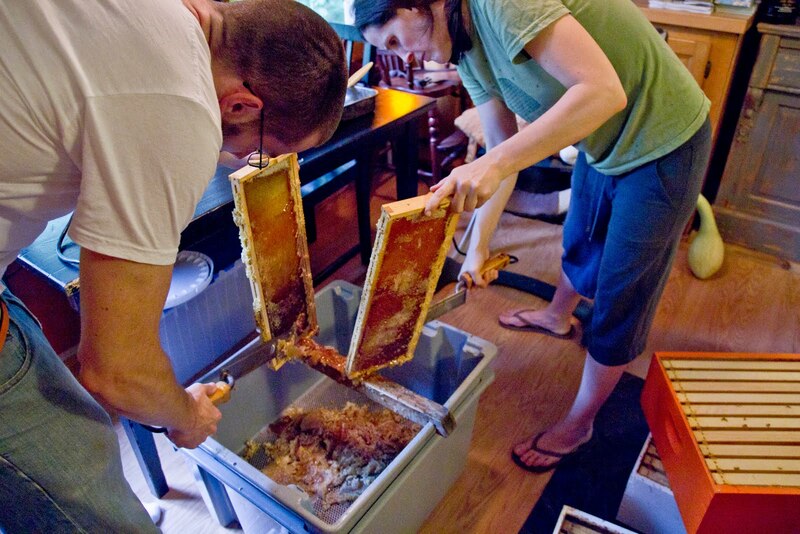 This fee allows the renter to check out the equipment for 3 days, which is ideal, as you'll need time to remove the supers bound for extraction from the hives, take out the honey, bottle it, and then clean everything thoroughly before returning it. 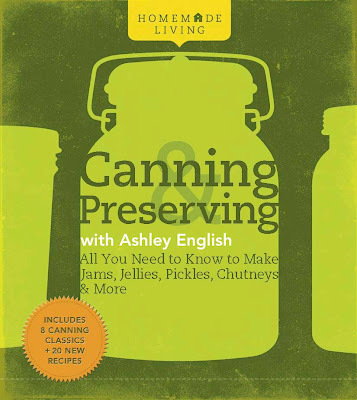 I've canned plenty of things. I've made all manner of homemade dairy products. I've baked bread and made bitters and grown vegetables and planted fruit trees and gathered eggs from my chickens. Something about extracting honey, though, really makes me feel connected to food in the most profound way. Perhaps it's because the tradition is so time-honored. Maybe it's because it is a slow, laborious process, inviting so much in terms of reflection and gratitude. Whatever it is, it's absolutely awesome, humbling, and a glorious, sticky mess, and I love every second of it!!! FRIENDS! 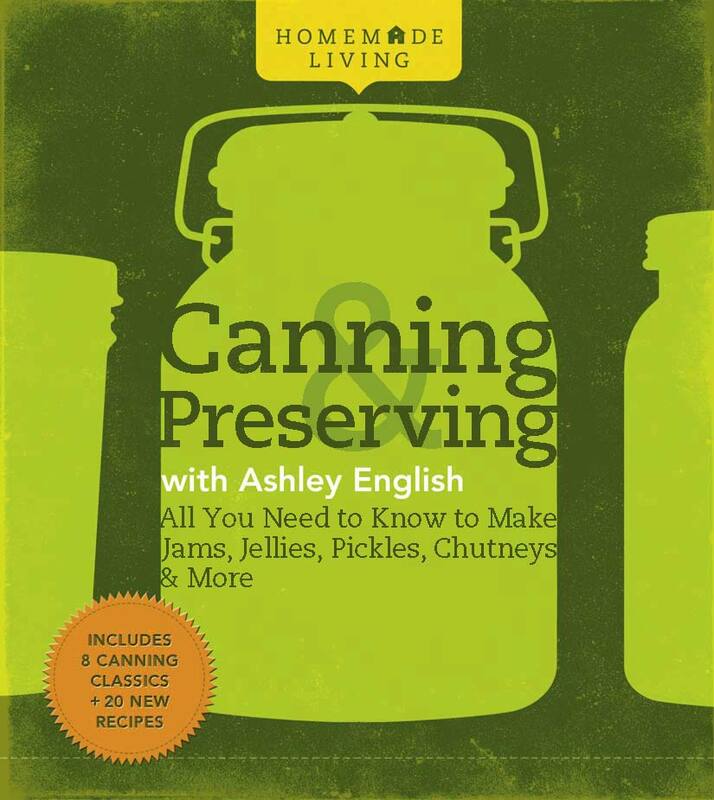 For reasons that I know nothing about, my "Canning & Preserving" book is now a mere $9.77 on Amazon! I have no idea how long this sale will last, but that's over half-off the cover price. I've you've been on the fence about taking the plunge and picking up a copy, there's clearly no better time than now to do so!!! I cannot declare quite enough my admiration for Hugh Fearnley-Whittingstall. I've written about him on here before, gushing, fawning and otherwise sustainable-crushing on him. Based in the U.K., Hugh is an advocate for so very many of the things near and dear to my heart, including land sharing, sustainable agriculture, and preparing wholesome, delicious foods to share with loved ones. Furthermore, Hugh and his work brought me in a roundabout way to Elisa Rathje, living across the pond in Sussex, whose blog is sheer heaven. Some of you might recall this post, written shortly after Huxley was born, in which I mentioned my return to meat-eating. I realize that consumption of animal products isn't for everyone, and I honor that. In fact, I held that stance myself for a long, long time. For me, though, the return to eating grass-fed beef and pastured poultry has paralleled a profound leap forward in my own health. We are immensely fortunate to live in an area where such foods are readily available. Back in June, during the Farm Tour, we visited two of the farms from where we acquire our meats, Hickory Nut Gap (beef) and East Fork (lamb). It's an incredible experience to meet the farmers and view the land responsible for producing the foods you and your family eat. 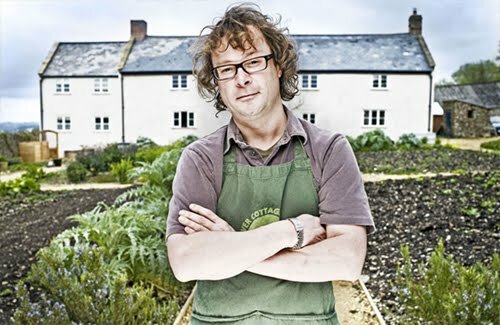 I invite you to visit the River Cottage website. It's full of inspiration, wisdom, and education. To honor Hugh and his crew and all that they do (say that 5 times fast!!! 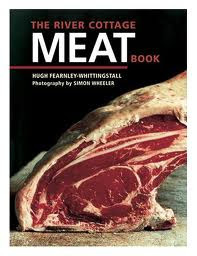 ), today I'm giving away a copy of The River Cottage Meat Book. This book is rife with information, recipes and ideas for consuming ethically-sourced and raised meats. To enter, simply leave a comment listing what sustainable meat means to you. For me, it means an animal raised in an absolutely ideal environment, co-existing in a mutually beneficial relationship with the soil (when ruminants graze on grasses, it creates deep-rooted perennial grass systems that massively increase the soil's vitality). This symbiotic relationship evolved over millennia and creates an end product that is chock-a-block full of nutrients for humans and animals alike. This article in Seed magazine expertly outlines the tenants of rotational grazing/holistic land management with animals as utilized by 2010 Buckminster Fuller Challenge winner Allan Savory. The giveaway will run for a week, ending at midnight EST September 9th. Given the heft of the book (it's a biggun'!) and my budget, I'm opening the contest only to U.S. residents (sorry international buddies!). PLEASE leave a means of reaching you, either via a link-back to your blog or your email address, so that I can contact you should you be the winner. UPDATE: The Random Number Generator has chosen Yasmin, lucky #4, to receive a copy of The River Cottage Meat Book. Thank you SO very much to all who entered! And be on the lookout for more awesome free things coming your way very, very soon! Here's a quick peek at our fall garden. I took it this morning, on the little hill that runs alongside the way up to the chicken coop (you can see my tiny helper in tow; he was in the Ergo, hence the odd angle of the photo). Last weekend, our friends Faryn and Eli and their little tot Milo came over and helped us plant a mess of garden starts. We put in: lots of lettuces, broccoli, cauliflower, brussels sprouts, several types of cabbages, collards, beets and carrots. I've got some more to go in still, including spinach, arugula, kohlrabi, and turnips. I'll post more photos as the garden comes along. If you're looking for some great information on putting in an autumn garden, I highly suggest the current issue of Back Home magazine, as well as Mother Earth News' most recent addition of its "Wiser Living Series." Both have fantastic pieces on no-fail tips for fall garden success. Are any of you putting in an autumn garden? If so, what are you planting? And what have I missed that I should plant, in your opinion?